This walk begins at Purfleet station, and explores the historic river frontage with its many reminders of Thurrock’s industrial heritage. 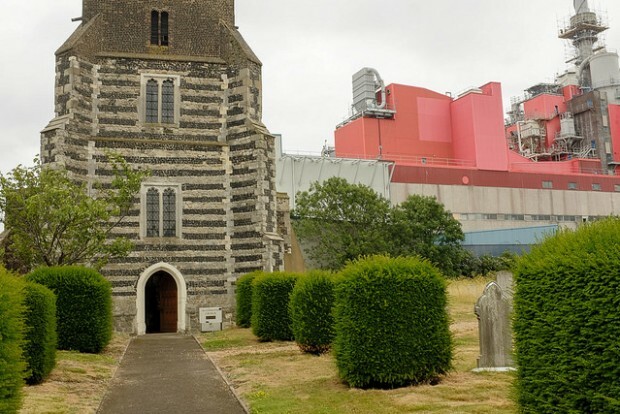 We’ll walk beside the river, over the Dartford Tunnel and under the QE2 Bridge, passing the Graffiti Wall and the old wharves, as well as the tiny church of St Clement, featured in Four Weddings and a Funeral, before arriving at Grays Beach Riverside Park. Download a map here Walk 19. Please note: buggies will need to be lifted in places. These walks are of different lengths and on different terrain. Some are mainly on footpaths, and others mainly on footpaths where ground may be uneven. Download our map here Walk 19 and use the colour coding so that you can decide if a route will be suitable for you.